Shake your phone and take the red thing above the door. Slide your finger across the left wood pile and pick up the ladder. Do the same with the right wood pile and take the single piece of wood. 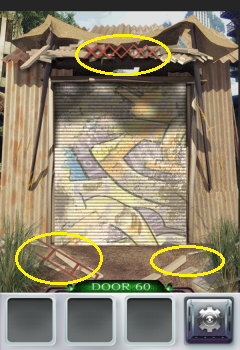 Place the ladder looking red piece under the door. Place the piece of wood on top of it, then the other red piece on top of that. 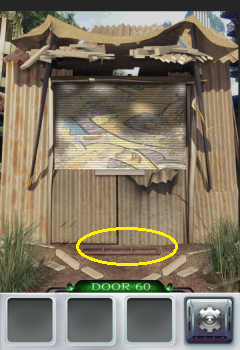 Repeatedly tap the new thing you made until the door is all the way open.